When Tom Frantz envisions the future, he doesn’t see Richmond and Hampton Roads as separate places. He sees a “mega-region” of 3 million people, stretching from the sands of Virginia Beach to the stately columns of Richmond’s state Capitol. The chairman emeritus of the Williams Mullen law firm and a leader in economic development initiatives, Frantz foresees collaborative alliances in biosciences and advanced manufacturing. They would be supported by transportation systems linking the two metros. People and goods could travel back and forth via a widened Interstate 64, an improved U.S. 460, a high-speed train or a barge on the James River. With the Port of Virginia in Hampton Roads serving as a global gateway and Richmond’s growing prominence as a logistics hub, Frantz believes both areas would benefit by touting their related synergies. The idea isn’t entirely new. 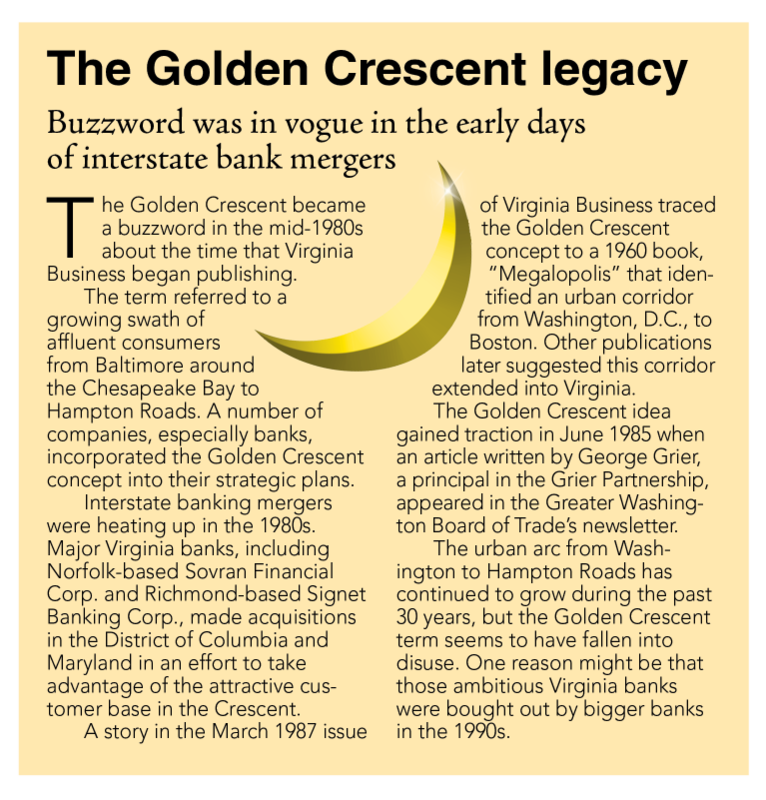 When Virginia Business began publication 30 years ago, there was talk of a Golden Crescent of prosperity in Virginia, arcing around the Chesapeake Bay from Washington, D.C., to Hampton Roads (see story on Page 43). At that time there wasn’t much development east of Richmond to Williamsburg. That has changed with new housing developments and businesses locating in New Kent and James City counties. So to many people, the idea makes more sense now. Plus, there’s a sense of urgency. Virginia’s economy, hard hit by defense cuts, needs a boost. 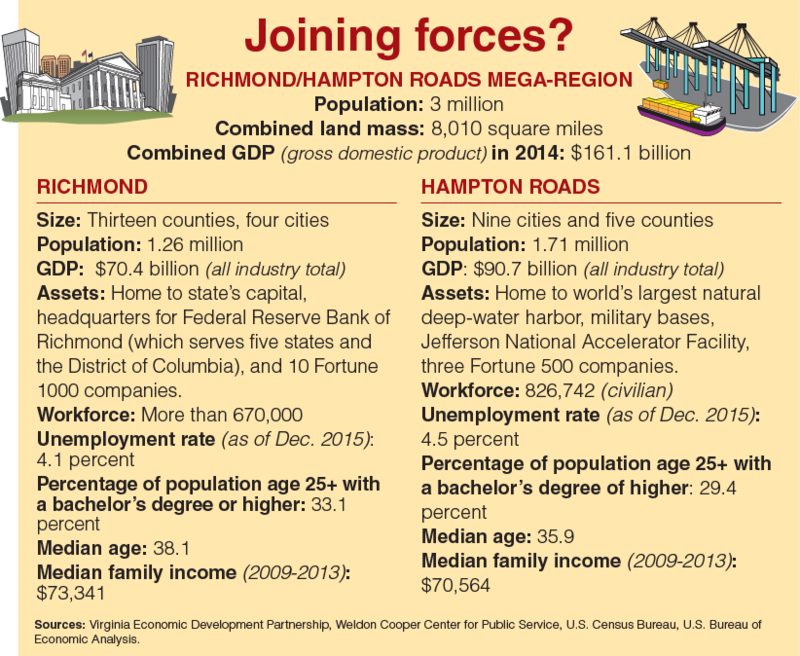 The Brookings Institution’s recent Metro Monitor Report ranked the Richmond region 59th economically among the top 100 in metro areas, while Hampton Roads was 97th. The rankings are based on job growth, gross regional product and aggregate wages from 2009 to 2014. Overall, Virginia also is lagging. According to the U. S. Bureau of Economic Analysis, the commonwealth saw virtually no growth in real gross domestic product (GDP) in 2014. Virginia ranked 48th among the 50 states, outperforming only Alaska and Mississippi. The end of 2015 brought better news. Virginia reported 1.5 percent growth in nonfarm employment, compared to the year before, a bump that trailed a national increase of 1.9 percent. Seventy-seven percent of the nation’s population and 80 percent of its economic growth are expected to occur in 11 global gateway regions between now and 2050. Those statistics come from America 2050, a national infrastructure and planning program based in New York. Since the program began in 2005, it has focused on growth issues, including the emergence of the 11 mega-regions. On the list are the Northeast Mega-Region, which runs from Boston to Washington, D.C., and the Piedmont Atlantic Mega-Region, which spans from Birmingham, Ala., to Atlanta on to Raleigh-Durham, N.C. The theory espoused in “The Metropolitan Revolution” is that large metro­politan areas will be dominant because they are more nimble than state and federal government bureaucracies, thus better able to solve problems. Think of Portland, Ore.’s sustainability initiative or Denver’s expansion of public transit. With overlapping networks of elected officials, heads of companies, universities and nonprofits already in place, metros can chart their destinies by collaborating and moving forward on concerns such as job creation, transportation and higher education — issues that get mired in the gridlock of Washington’s partisan politics. The metro model has gained momentum since the Great Recession of 2007-09. Katz and Bradley refer to the economic downturn as a “brutal wake-up call” for cities and metropolitan areas because it drove home the realization that Uncle Sam can’t always come to the rescue. Yet when one considers existing mega-regions — the population in the greater Atlanta area alone is 5.6 million — a Richmond-to-Hampton Roads region seems a bit small. “We’re just in the early stages,” says Frantz. He expects it will take five years to get a political and public buy-in for a mega-region. Since there is no official process for designating a mega-region, it’s primarily a self-declared rebranding. In the meantime, supporters want to put up a website, create an umbrella organization and commission an economic impact study to support the idea. And that’s just the beginning. The ultimate goal — after establishing patterns of inward and outward migration — would be to apply for the status of a Combined Statistical Area (CSA), which is an official designation from the U.S. Office of Planning and Budget. There are 169 CSAs in the U.S. This federal designation, says Frantz, comes into play with many decision makers: when federal and state officials allocate public funding for infrastructure projects, companies make relocation and expansion decisions, professional sports teams select venues, and businesses spend advertising dollars. Frantz saw evidence of this dynamic in 2013 when Virginia Beach dropped out of contention to woo the Sacramento Kings — an NBA basketball team. The city, which has a population of nearly half a million, represents the largest market in the country without a major league sports team. But Virginia Beach didn’t have an arena large enough to accommodate the Kings. Now plans have been approved for a privately owned facility seating more than 15,000 people. Mega-regions are made up of MSAs and CSAs. The lines blur as areas collaborate on issues. In the long-term, Frantz and his allies have their eyes on joining up with the Northeast Mega-region. In 2012, Frantz helped form the 32-member Hampton Roads Business Roundtable, which is collaborating on the mega-region issue with the Richmond Management Roundtable. The membership list in each group reads like a Who’s Who of Virginia’s business elite. In Hampton Roads, there’s Dubby Wynne, a community activist and chairman of the Hampton Roads Community Foundation, and John Reinhart, CEO and executive director of the Virginia Port Authority, to name just two. Members of Richmond’s roundtable include John Luke, non-executive chairman of WestRock Co.; and Jim Ukrop and Ted Chandler, partners in the venture capital group New Richmond Ventures. The groups meet quarterly. At last fall’s gathering, they agreed on a list of initiatives to support during this year’s General Assembly. 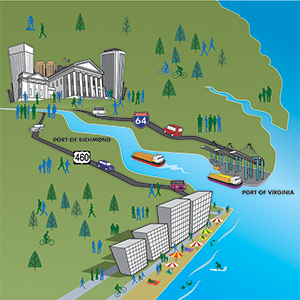 After successfully lobbying for the widening of Interstate 64 last year, from Highway 199 in Williamsburg to the Hampton Roads Bridge Tunnel, the groups are supporting these goals in 2016: $350 million in funding for infrastructure improvements at the Port of Virginia; $39 million in funding for GO Virginia, a program that would provide state funds to localities that collaborate on economic development and government efficiency projects; and the continued widening of I-64, from 199 to the 295 bypass at Richmond. Eugene Trani takes much the same view. 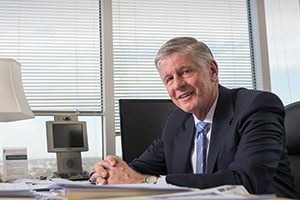 Trani, the president emeritus of Virginia Commonwealth University, is credited with expanding VCU’s role as an economic development engine during his tenure. He now leads Richmond’s Future, an independent think tank that has been studying the future of the region since 2011. The group released a report in February that discusses the best path forward for economic growth. It did not recommend a mega-region. “We have come to the conclusion not to adopt the mega-region but to focus on regional strategies between the Richmond metro area and Hampton Roads in the area of logistics,” says Trani. Between the ports in Hampton Roads and the Richmond port, now under the management of the Virginia Port Authority, “we see a major opportunity for cooperation.” A mega-region approach may be appropriate further down the road, Trani adds, and it should include a focus on the area’s higher education assets. While the areas share commonalities, there also are differences. Bob Holsworth, who worked for Trani at VCU and served as research director on the Richmond’s Future project, notes some of these differences. “One is educational attainment,” he says, with the Richmond metro area having a higher percentage of people with college degrees. A new 40-year lease on Richmond’s port held by the state’s port authority is expected to spark economic opportunities for the city as well as Hampton Roads. The Richmond Marine Terminal is located on the James River, just off I-95 with access to rail and barge service. With $17 million in upgrades planned, business leaders hope that the port will be a magnet for companies that need to move cargo. Plus, it will be better equipped to offload containers coming to Richmond by barge on the James River from Hampton Roads. The barge service “takes the wear and tear off I-64 [from container truck traffic], and it’s more economical to move the goods by barge to Richmond. We all benefit,” says Chandler of New Richmond Ventures. With a central East Coast location — about a two days’ drive from most of the country’s population centers — Richmond already has attracted several large distribution centers including Amazon.com, and Republic National Distributing Co., the second-largest wine and spirits wholesaler in the U.S.
Hampton Roads is home to the third-largest container port on the East Coast in terms of cargo volume and has the deepest channel at 50 feet. Plans to further deepen the harbor to 55 feet will give it a competitive edge in an era of supersize ships. In fiscal 2013, the port generated $60.3 billion in port-related spending on goods and services. However the port’s total economic impact that year, including the movement of bulk goods and containerized cargo, was $88.4 billion, according to a study by the Mason School of Business at the College of William and Mary. The larger figure represented 10 percent of the state’s GSP (gross state product). In addition to linkage on economic growth issues, the business roundtables see the potential for creating a powerful voting coalition among the metro areas’ legislators in the General Assembly. “Once you start thinking about the common interests between Richmond and Hampton Roads, then you begin to pull your political influence to get things accomplished …,” says Chandler. Morrison is director of the Northeast Ohio Sustainable Communities Consortium (NEOSCC) and the architect behind an award-winning comprehensive plan for the future for Northeast Ohio, (Cleveland-Akron, Canton-Youngstown), a 12-county project. In the early stages, Morrison says he would target young people. Millennials have grown up with technology like Google Earth, and “they think about things a lot differently than their mothers and fathers … I see this in our state leaders in their 30s, they don’t get this parochial stuff,” he says.